A 400-year-old clue in the coffin of Sir Francis Drake sets a modern-day fortune hunter on a exploration for the fabled treasure of El Dorado, leading to the discovery of a forgotten island in the middle of the Pacific Ocean. 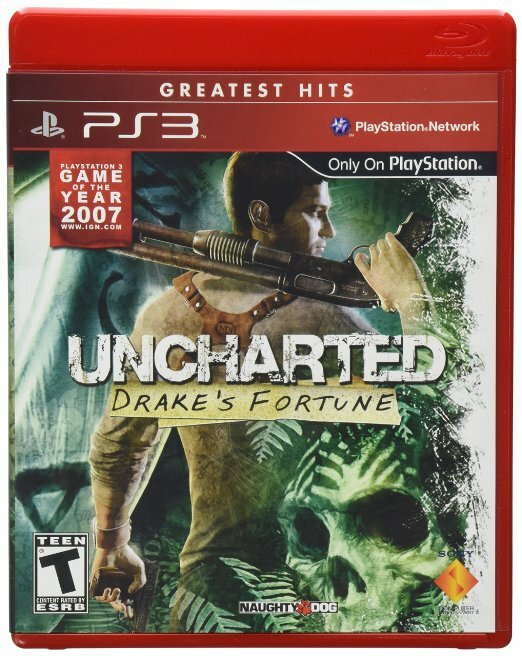 Having played NaughtyDog’s last PS3 game, then played their first PS3 game, I’ve come to the conclusion that we don’t see eye to eye on how game play mechanics should work. The graphics, story, art direction, everything but the game play is spot on and incredibly impressive for a game that was released so early in the PS3’s timeline. The game play though, that’s where I wonder why there’s such a huge disconnect from what I would expect from the game vs what they’re wanting to present. Two things come to mind immediately: Aiming and paper puzzles. The aiming in the game is off, there’s no other way to say it. If you’re being shot at by a mob and you hit the left bumper, you don’t aim in on the center of the screen like you would assume, you aim in on where ever your character’s eyes are pointed, which is often a fair bit off to the side or even above the guy that’s shooting at you. I was thinking that perhaps this was a PS3 thing and not a NaughtyDog thing, but after I was done with Uncharted I played 20-30 minutes of Infamous and it’s aiming is spot on and actually enjoyable. Literally every time I had to do precision shooting in Uncharted it was a struggle, one that I dealt with by taking things incredibly slowly. Go too slowly though and the game will punish you by overrunning you with machine guns or rocket launchers, so you end up having to just run around and figure out where everyone is coming from, die many times, then once you have their spawn patterns memorized, sprint and kill them as quickly as possible. Not fun at all. The paper puzzles are also either hilariously bad or hilariously easy, the one that was tripping me up was the one that had four statues that you had to reposition. According to the art in the game, you had to have them all facing in, but that was the default state, so after 30 minutes of screwing around with it, I find a walk through and made the singular adjustment that was required to open the hidden door. Talking about that area reminds me of a gaming trope that’s strong in the game: the thousand year old ruin with no roof and running water going right through it. Also, the we just opened this sealed tomb, so where are all these guys coming from that I’m shooting? I’m going to be skipping the rest of this series, as I’m pretty sure it’s going to be more of the same.